, an eminently learned divine, was the son of the preceding, by Margaret his wife, daughter of Thomas Wyld, of Worcester, esq. and was born at Longworth in Berkshire, June 23, 1625. He was educated mostly at the free-school of Thame in Oxfordshire; and in 1636, when he was only eleven years of age, was admitted student of Christ Church in Oxford. In Oct. 1640 he took the degree of B. A. and that of M. A. in June 1643j about which time he was in arms for Charles I. within the garrison of Oxford, and afterwards became an ensign. In 1648 he was turned out of his place by the parliamentarian visitors, being then in holy orders; and from that time till the restoration of Charles II. 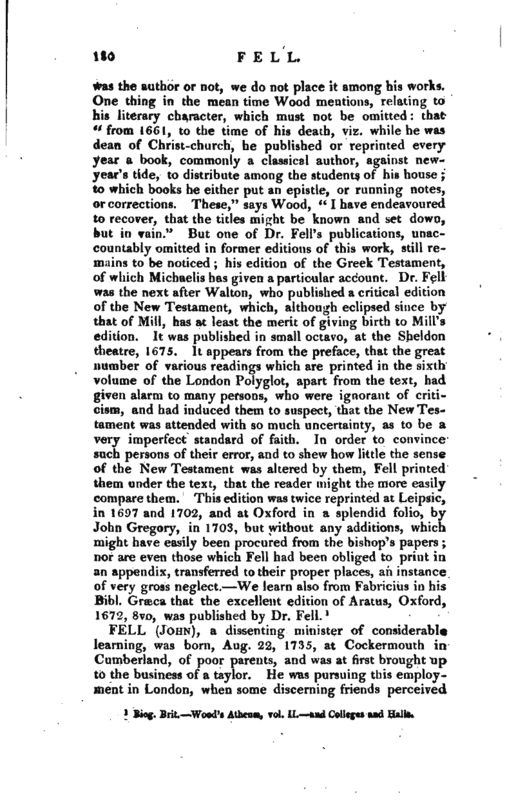 lived in a retired and studious manner, partly in the lodgings, at Christ Church, of the famous physician Willis, who was his brother-in-law, and partly in his own house opposite Merton college, wherein he and others kept up the devotions and discipline of the church of England. A.fter the restoration he was made prebendary of Chichester, and canon of Christ Church, in which last place he was installed July 27, 1660; and in Nov. following was made dean, being then D. D. and chaplain in ordinary to the king. As soon as he was fixed, he earnestly applied himself to purge the college of all remains of hypocrisy and nonsense, so prevalent in the late times of confusion, and to improve it in all sorts of learning as well as true religion. Nor was he more diligent in restoring its discipline, than in adorning it with magnificent buildings, towards which he contributed very great sums. By his own benefactions, and what he procured from others, he completed the north side of the great quadrangle, which had remained unfinished from Wolsey’s time, and in which his father had made some progress when interrupted by the rebellion. He rebuilt also part of the lodgings of the canon of the second stall, the east side of the chaplain’s quadrangle, the buildings adjoining fronting the meadows, the lodgings belonging to the canon of the third stall, and the handsome tower over the principal gate of the college; into which, in 1683, he caused to be removed out of the | steeple in the cathedral, the bell called “Great Tom of Christ Church,” feaid to have been brought thither with the other bells from Oseney-abbey, which he had re-cast with additional metal, so that it is now one of the largest bells in England. Round it is this inscription: “Magnus Thomas Clusius Oxoniensis, renatus April viii. MDCLXXX. regnante Carolo Secundo, Decano Johanne Oxon. Episcopo, Subdecano Gulielmo Jane S. S. Theol. Professore, Thesaurario Henrico Smith S. S. Theol. Professore, cura et arte Christopher! Hodson.” Sixteen men are required to ring it; and it was first rung out on May 29, 1684. From that time to this it has been tolled every night, as a signal to all scholars to repair to their respective colleges and halls; and so it used to be before its removal. 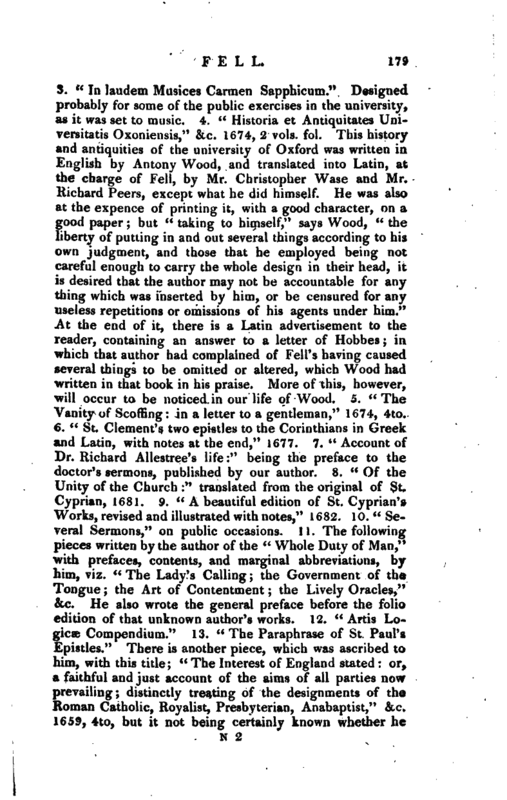 In 1666, 1667, 1668, and part of 1669, Dr. Fell was vice-chancellor of the university: during which time he used all possible means to restore the discipline and credit of the place; and such was his indefatigable spirit, that he succeeded beyond all expectation. 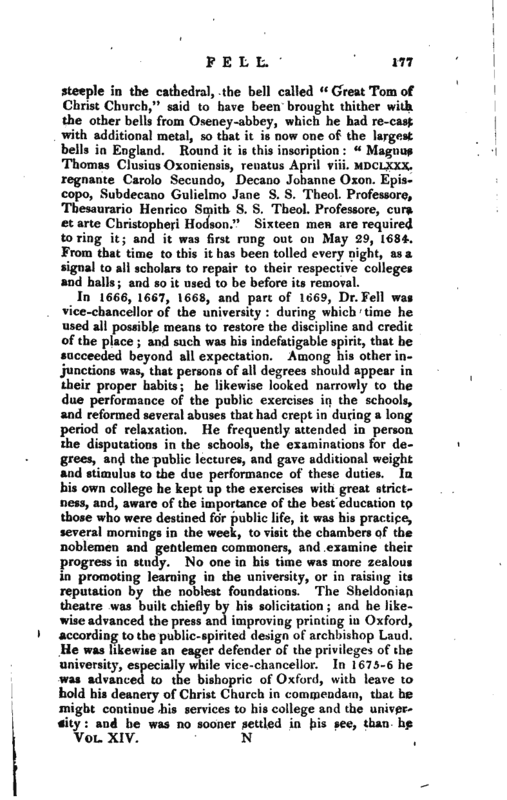 Among his other injunctions was, that persons of all degrees should appear in their proper habits; he likewise looked narrowly to the due performance of the public exercises in the schools, and reformed several abuses that had crept in during a long period of relaxation. He frequently attended in person the disputations in the schools, the examinations for degrees, and the public lectures, and gave additional weight and stimulus to the due performance of these duties. 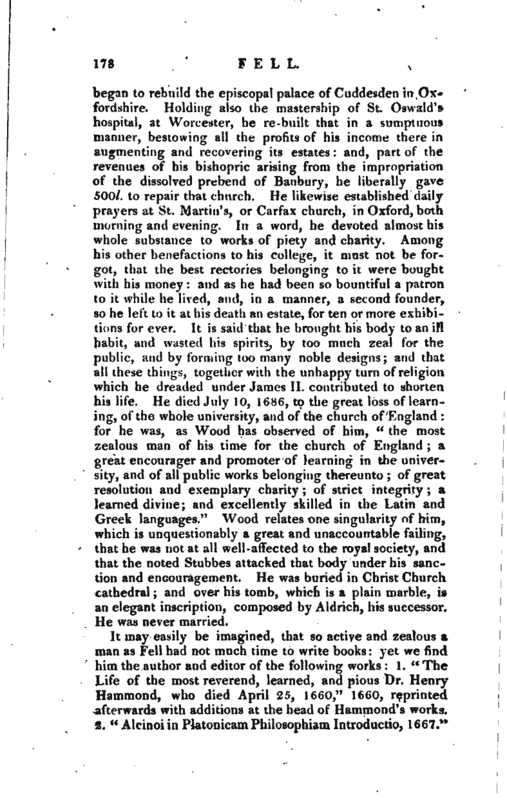 In his own college he kept up the exercises with great strictness, and, aware of the importance of the best education to those who were destined for public life, it was his practice, several mornings in the week, to visit the chambers of the noblemen and gentlemen commoners, and examine their progress in study. No one in his time was more zealous in promoting learning in the university, or in raising its reputation by the noblest foundations. The Sheldonian theatre was built chiefly by his solicitation; and he likewise advanced the press and improving printing in Oxford, according to the public-spirited design of archbishop Laud. He was likewise an eager defender of the privileges of the university, especially while vice-chancellor. In 1675-6 he was advanced to the bishopric of Oxford, with leave to hold his deanery of Christ Church in commendarn, that he might continue his services to his college and the university: and he was no sooner settled in his see, than he | began to rebuild the episcopal palace of Cuddesden in Oxfordshire. Holding also the mastership of St. Oswald’s hospital, at Worcester, he re-built that in a sumptuous manner, bestowing all the profits of his income there in augmenting and recovering its estates: and, part of the revenues of his bishopric arising from the impropriation of the dissolved prebend of Banbury, he liberally gave 500l. to repair that church. He likewise established daily prayers at St. Martin’s, or Carfax church, in Oxford, both morning and evening. In a word, he devoted almost his whole substance to works of piety and charity. 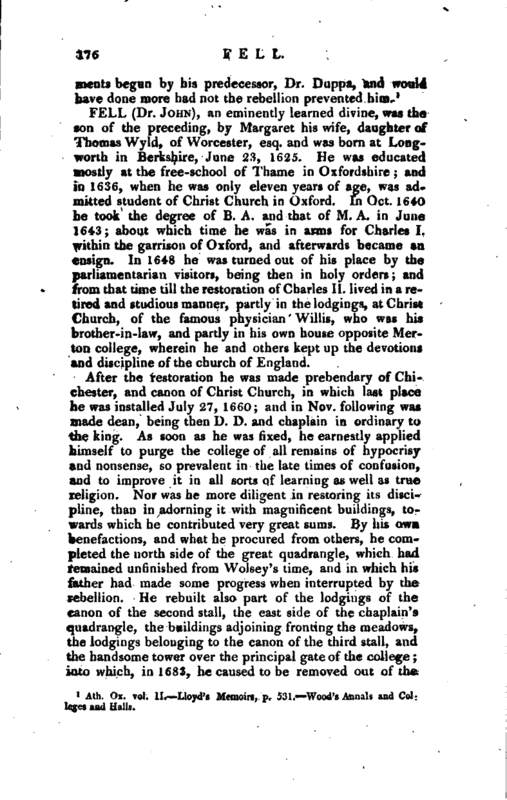 Among his other benefactions to his college, it must not be forgot, that the best rectories belonging to it were bought with his money: and as he had been so bountiful a patron to it while he lived, and, in a manner, a second founder, so he left to it at his death an estate, for ten or more exhibitions for ever. It is said that he brought his body to an ill habit, and wasted his spirits, by too much zeal for the public, and by forming too many noble designs; and that all these things, together with the unhappy turn of religion which he dreaded under James II. contributed to shorten his life. He.died July 10, 1686, to the great loss of learning, of the whole university, and of the church of England: for he was, as Wood has observed of him, “the most zealous man of his time for the church of England; a great encourager and promoter of learning in the university, and of all public works belonging thereunto of great resolution and exemplary charity; of strict integrity; a learned divine; and excellently skilled in the Latin and Greek languages.” Wood relates one singularity of him, which is unquestionably a great and unaccountable failing, that he was not at all well-atfected to the royal society, and that the noted Stubbes attacked that body under his sanction and encouragement. He was buried in Christ Church cathedral; and over his tomb, which is a plain marble, is an elegant inscription, composed by Aldrich, his successor. He was never married. Biog. Brit. Wood’s Athens, vol. II. and Colleges and Halls.